The FDT100 series has been discontinued. Please see the FDT500 Series as a possible alternative or contact our flow dept. Engineering department. The FDT100 Series comprises advanced-technology water flowmeters. This series uses transit-time ultrasonic technology in which the signal is transmitted and received alternately between 2 flow sensors and the “time of flight” determines the flow rate. The battery-powered transmitter comes in the user’s choice of an integrally mounted display or a remote-mount version. 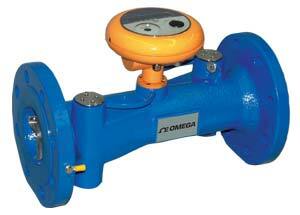 Applications include both commercial and consumable water measurement. Long-term stability and a wide measurement range make it possible not only to measure water consumption, but also to monitor systems for water leakage. Because the FDT100 Series has no moving parts, system pressure loss is minimal and filtration is not required. Display flow rate or total at the push of a button. Installation is aided by 150-lb ANSI flanges in sizes from 2 to 8". NOTE: HEAVY WEIGHT - OVERWEIGHT SHIPPING CHARGES MAY APPLY FOR THIS PRODUCT. IF ORDERED ON-LINE, INTERNET SALES WILL CONTACT YOU AFTER ORDER PLACEMENT UNLESS YOU OPT TO CHARGE FREIGHT TO YOUR CARRIER ACCOUNT. 참고: Comes complete with battery, 3-Point Nist Calibration Certificate and operator's manual.